What is meant by encapsulation in java? Here data means variables and functionalities means methods. So keeping the variable and related methods in one place. That place is "class". class is the base for encapsulation. What is encapsulation in object oriented programming? The above example program shows how the variables and methods will be there in a class. 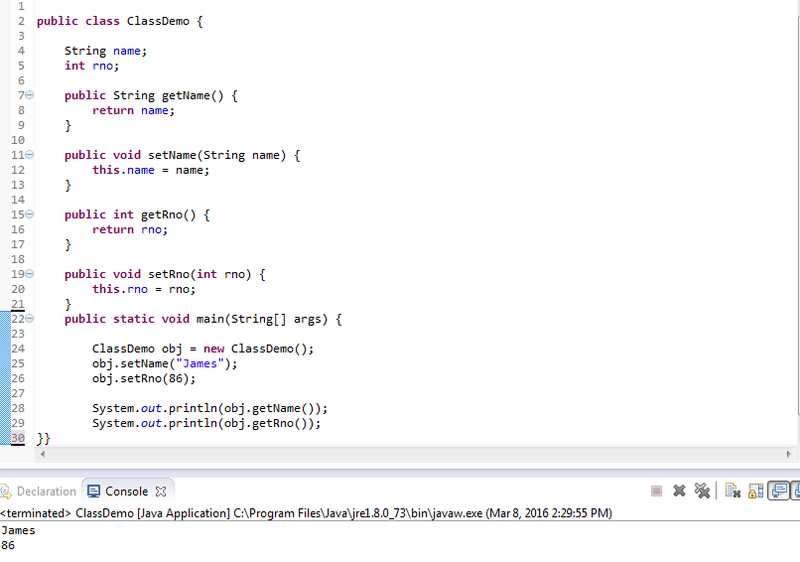 class is user defined data type in java means by using class we can structure our own programs. Lest see a example program on class. Instance of class is known as object. Instance means dynamic memory allocation. So dynamic memory allocation to class is called object. By using "new" keyword the object will be created dynamically. Class is a template. By using object we will get memory for all variables so that we can use them. We can create number of objects for one class based on our requirements. Below an example program on class and object. Amazing . keep going !